"In my dream, I was dispatched on a mission to discover the existence behind existence, and I departed for a universe starred with mirrors, in which I saw myself from behind. It was this morning that I made telepathic contact with you, and found out about your project. It seems to me that my path was already laid out. What do you think of that, Priest?" Brother Alban raised his eyebrows. "It's the path of wisdom, Lord. The Global Mind was certainly the divine messenger of that dream." 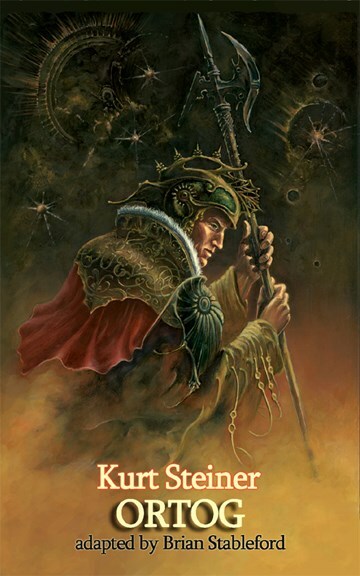 These two classic French fantasy novels, written in 1960 and 1969, star Knight-Navigator Dal Ortog of Galankar who lives on a 50th century Earth where space travel cohexists with a medieval society. First, Ortog is sent by Sopharch Karella to the far reaches of space to find a cure for the slow death that is killing humanity after a devastating interplanetary war. Ortog returns with a cure, but too late to save his love, Karella's daughter, Kalla. In the sequel, Ortog and his friend, Zoltan Charles Henderson de Nancy, embark on a quest through the dimensions of Death to find Kalla's soul and bring her back to Earth. "Kurt Steiner" is the pseudonym of André Ruellan, one of France's best-known science fiction and horror writers, as well as one of its most distinguished film writers.